The difference between fine and ordinary photography is in the small details how our brain perceive the light captured on the image. There is only one control, the mighty Orb. There is only one, single, self-explanatory control – the Orb that smoothly changes the perceived light according to the type of photography and the photographers taste. 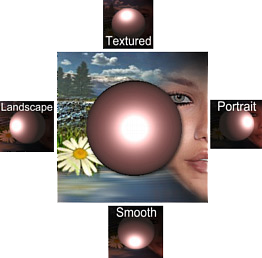 The Orb controls the mixture between Landscape and Portrait processing and between smooth and texture enhanced output. Everything else is in between. Orbis Luminum affects the light by a subtle way so the image will appear more clear and vibrant. Sounds pretty vague, right? Paintings from your photos the easiest way! Van Gogh, Monet, Benson, Corot, Cézanne, Sorolla, Pissarro and many others.